Business is booming, team Psquared (get it - Pamela Pekerman!) needs help and it's been a year since I've had an amazing intern - hi Paula, I miss you! So, I'm on the hunt for a fabulous gal or guy that wants to learn every aspect of the fashion busines - branding, publishing, broadcasting, marketing, editorial and more. If you are a fan of The Rachel Zoe Project, committed to reading VOGUE and ELLE, and enjoy snagging $250 Louboutin pumps at Saks Fifth Avenue, read on! This is an UNPAID internship, ideal for a college student or recent grad based in the NYC area. You will be assisting me with many aspects of growing my brand - and there is a lot to come in late 2010 and beyond!! - assist at/attend key meetings with pr executives, designers, Pamela’s agent, etc. A 2-3 day commitment approx 10am-6pm is requested. You must live in the NYC area. Please submit resumes to info@bagtrends.com. I would like to fill the position by September 15 or sooner! In addition to Jennifer Lopez, Karen Robinovitz, Kelly Ripa and Kathryn Finney, I officialyl have a new female power woman to lust after and admire in a totally professional way – Joy Mangano. If that name doesn’t ring a bell, you clearly don’t watch enough HSN. If you did, you would have seen Joy selling her wares, which include Huggable Hangers, velvety hangers that are lightweight, ultra-thin, and the #1 selling product in the history of HSN or Clothes It All Luxury Carry All Luggage Set which lets you turn your roller into a portable closet with drawers. And then of course, you can catch Joy cooking up a storm with cutie-pie chef Todd English using their revolutionary GreenPan collection that uses Thermolon non-stick technology – the first completely PTFE-free (look that stuff up, it’s nasty!) non-stick cookware. Although I’ve worked on HSN in the past, I never had the pleasure of meeting Joy, so I was thrilled to have her personally present her best selling, and soon-to-be best selling, inventions at a press presentation held at the Buckingham Hotel. I had a 10am appointment and greeting me was this diminutive – in size but NOT in energy or presence – woman dressed in a sleek black pencil skirt and draped red blouse, with perfectly quaffed hair and a French manicure. Boy was I glad for my emergency, AM hair blowout! But, from our 45 minute appointment (which I actually thought would be 15-20 minutes) I learned Joy isn’t just a pretty face pedaling products. She is woman who, as HSN’s executive vice president Bill Brand puts it, “solves simple problem.” She reacts to her ahhhaaa moments, rather than sit on the sidelines and let others come up with the same concept. I love that! Ladies, we should all try to channel a little big of Joy’s joy – love what we do, follow thru with our convictions, believe in ourselves and know our business inside and out. Yes, that last one is important! Don’t just be the face of something. Don’t just answer phones. Don’t just file tax papers. Don’t just go through the motions. To move up in life – even if you don’t plan to have your own company – it’s important to know the ins and outs of the field you are in. The important people will notice – trust me. When I was in college applying for magazine jobs, I used to review changes in the mastheads. I knew all the editors and their assistants – and last stories they worked on – as well as who owned what magazine and how they acquired it! For more on Joy Mangano and her products, check out HSN.com. Do you dream of showing your women's wear fashion during New York's prestigious Fashion Week? If so, you are luck! 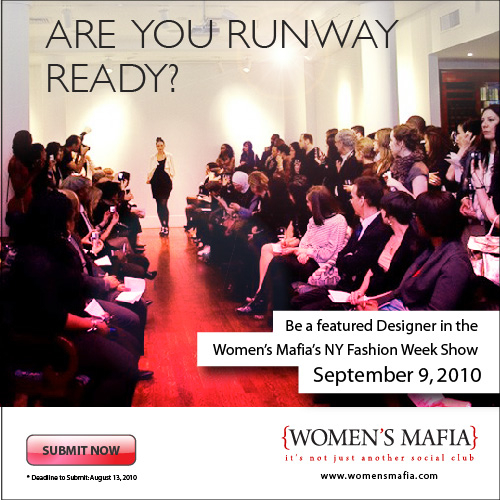 Women's Mafia is accepting applications for their semi-annual "Are You Runway Ready?" Fashion Week Competition. Applications MUST BE IN BY TOMORROW. The winners will show their collections on September 9th during an exclusive, media event to kick off Fall 2010 Fashion Week. This coming Friday, a group of fabulously well-healed judges [myself included - natch ;) ] will select winners. Other judges include my dear friend Zadile Blay (of Paper mag fame and other fabulous things), David Zyla (stylist for ABC soap operas and a very dapper man all around) and Engie Hassan (designer and stylist). "Are You Runway Ready?" Fill out the application ASAP TODAY and we'll see! PS The PR director for Women's Mafia has informed me that if you want to be involved as an accessories sponsor, please email marcy@yellowskyagency.com. Let her know I sent you, to ensure extra special love and attention. A few months ago, while attending a twitter party at Robert Verdi's house, I was gifted a three day trial for a Blue Print Cleanse. I'm not a detoxing/ juice cleansing kind of gal, but the sample juice I tried (I believe it was Green Apple) truly tasted yummy. Last week, I finally ordered my three day cleanse at Level 1, Renovation - there are three levels depending on your experience cleansing and eating raw foods. The ordering process was simple and I saved $50 on shipping by picking it up from Exhale Spa on Central Park South (OK, actually I sent my husband to do that part). There are tons of convenient locations in the city to pick up your juices, which are heavy so be prepared, and come with ice packs and a little lunch bag for cleansing on-the-go! If I were to pay for this cleanse it would be about $180. Fortunately, I get to test it out for free and then let you know if it's worth the bucks. I'm on "Renovation" so I get more fruity versus green juices. However, the first bottle is green - Green Lemon, to be exact. It's comprised of Romaine, Celery, Cucumber, Green apple, Spinach, Parsley and Lemon. I've been drinking for about 15 minutes and it's not going well. You should see my face! I can't deal with the tangy flavour combo, but I'm forging ahead. It is the first drink, after all. The goal is to finish this sucker in the next 20 minutes. Benefits to keep me motivated: Lemon - contains unique flavanoid compounds that have antioxidant and anti-cancer properties. High in Vitamin C, promotes a healthy immune system. Have you tried BP Cleanse? How did it go? Have you ever been on any cleansing program? If you are a serious fashion lover – meticulously dissecting the pages of VOGUE, glued to the best blogs for quick 411 during Fashion Week, planning our outfits in advances with accessories in mind – they you probably have come across the name Lori Goldstein. Lori is an iconic stylistic with twenty years of experience, who is constantly in demand for fashion shows, magazine shoots, advertising campaigns and more. She regularly styles shows for Vera Wang, Nina Ricci, Carolina Herrera and TSE, and has acted as creative consultant and stylist for numerous celebrities including Madonna, Demi Moore, Julianne Moore and Anne Hathaway. Lori also designs a line for QVC called LOGO by Lori Goldstein and tonight she’s debuting a great handbag that retails under $75. (You knew the bag hook was coming, I’m sure.) Buying this handbag is like getting Lori’s personal stamp of approval. Who wouldn’t want a legendary stylist to say they look good? This multi compartments bag has a three layer flap with plenty of pockets and is constructed from faux snake skin and PVC – translation: scuff proof! Best of all – aside from the price – is the versatility of wearing the bag cross body, ultra long to one side or as a traditional purse simply by adjusting the shoulder strap. Given my diminutive height, I’ll be sporting this style at a shorter shoulder strap length. Share Your Thoughts: Do you love this bag? Yah or Nah? Are you a QVC addict? Have you shopped LOGO by Lori Goldstein in the past? Leave a comment and one lucky WINNER WILL WIN THIS BAG! It’s time for another giveaway and this go around it’s a bag, actually two, full of back to campus necessities. Don’t worry if you’re past the collegiate age, these fashion and beauty items will be ideal for all ages. Well, maybe you can just give the pink backpack to your little niece. All rules are below. I’d like to thank my friends from Think PR for helping put this giveaway together. You guys are amazing and it’s been my pleasure working with you for the past five years. 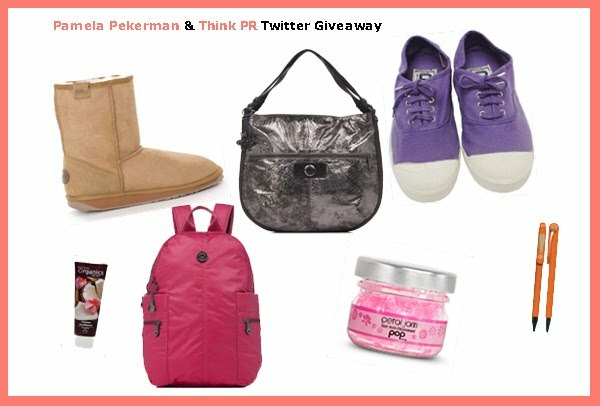 2) Retweet (RT) "get back-to-campus ready w @kiplingusa & @think_pr #giveaway http://ow.ly/2ltGn #pamgiveawaythink"